One way of ridding yourself of dark circles is going down the surgical route, but most of us would like to avoid that if possible. Here are some things that you can do at home to reduce the appearance of the circles. Eat right: The key to great skin is a balanced diet. Avoid salty foods, as this causes your body to retain water, which contributes to bloating and puffiness under your eyes. Along with this, you need to make sure you drink a lot of water, to flush out toxins in your body. Use a cold compress: A cold compress or even cooled, used teabags will temporarily reduce swelling and discoloration. Sleep: A lack of sleep makes you look paler, hence displaying your circles more, so make sure you get a good amount of sleep and keep your head elevated so fluid doesn’t pool up in your lower eyelids. 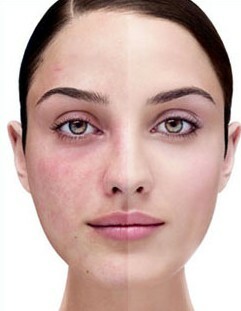 Saline spray: Nasal congestion could cause you to have under eye circles. An over-the-counter nasal spray can help prevent blood vessel dilation. Concealer: Finding the right concealer to cover up your under eye circles can be a tough task. Go to Sephora or a department store and test out different shades and types of concealers to find which best suits your face. A rule of thumb is to choose a concealer one shade lighter than your foundation. 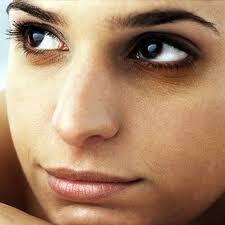 If you have very dark circles, you can even go two shades lighter. Be careful though, because a concealer that is too light will give you a “raccoon” look! Vitamin K: Find an eye cream that contains Vitamin K. These will help strengthen capillary walls so the dark circles will be less visible. Lancome’s EFFACERNES – Waterproof Protective Undereye Concealer that covers dark circles and the appearance of fine lines & wrinkles. Korres Evening Primrose Eye Cream – A great eye cream with Vitamin K.
Another way to distract attention from dark circles is to make your whole face brighter and more radiant overall, which reduces the “You Look Tired” comments. Try JUARA Skincare’s Sweet Black Tea and Rice Facial Moisturizer. The JUARA Turmeric Antioxidant Radiance Mask is also a good one to give you an overall glow (while it detoxes and purifies.) An extra bonus – since Turmeric is such a great antioxidant, to that theme, we’re donating 10% of sales of this mask to support Breast Cancer Awareness to Cancer & Careers through December 2010. It’s an organization that helps women in the workplace with cancer so let’s support them! Do you have special tricks, tips, or products you love that help with dark under-eye circles? Do share! So there’s this ‘new’ ingredient that’s popping up in the US in health supplements, skincare, and exotic dishes that’s raved about as uber healthy with anti-cancer properties: Turmeric. We often nod “oh, yes, that plant.” But what is it, and why is it so awesome? Oh, let me count the ways. For one, it’s one of Indonesia’s most revered spices/ingredients used in its herbal medicinal tradition and beauty rituals for centuries, but that’s not all. Hopefully this brief overview will leave you the most interesting person at your next dinner party when you can quip up on the wonders of this spice – and leave people wanting to try it out! What is it? Turmeric (Curcuma Longa) is a 5000 year old herb in the ginger family, and is known to grow wild in Southern Asia including India (oldest origin), Indonesia, Indochina, nearby Asian countries, and even in Hawaii. It is less fibrous than ginger, and has a nutty, slightly funky herbal/gingery smell to it and a nice, peppery and warm flavor. What is it used for? Many things. Its roots are used in cooking as a spice, medicine, and even dye to color fabric/food. Known for its bright yellow color that can stain, turmeric has been used as a food colorant and dye for cloth historically as a less expensive alternative to saffron. Indonesian and Indian cuisine frequent this ingredient, especially in curries, because it is not only yummy but healthy! In Indonesia, we use Turmeric in hundreds of healthy concoctions from a princess spa ritual to brighten skin to drunken medicines to help cleanse blood and liver. In Bali, a traditional healer mixed turmeric with sandalwood and water to create a paste he massaged in my sprained ankle to help reduce swelling and induce rapid healing! (For those of you who saw Eat, Pray, Love, yes – those healers do exist, I can personally attest to it!) 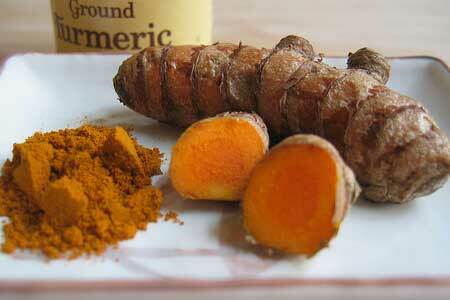 Turmeric is also widely used in Indian Ayurvedic systems, most widely used to purify blood. What’s the magic ingredient? Curcumin is the power ingredient in Turmeric that has many of the anti-inflammatory, anti-cancer, and blood purifying properties. Though studies conducted are still in the early stage, curcumin has shown positive effect on preventing cancer through its ability to suppress the proliferation of a wide variety of tumor cells and to inhibit harmful molecules and enzymes. Topically, like in our Turmeric Antioxidant Radiance Mask, the curcumin in our turmeric complex brightens skin and naturally fights discoloration and age spots naturally. It gives your skin a natural glow – just try it! 15 minutes and you’ll notice a difference. What does it do, in a nutshell? Overall, turmeric is an amazing antioxidant, thanks to an ingredient in it – curcurmin. Turmeric can detoxify the liver, reduce cholesterol, brighten skin complexion (see our Turmeric Antioxidant Radiance Mask), is naturally antiseptic and antibacterial, and does a whole lot more. So take your dose or turmeric – in capsules like a health supplement, fresh, or in a spice powder, in Jamu (Indonesian tonics), or in our JUARA Turmeric Antioxidant Radiance Mask. Enjoy! With the holidays already upon us, I sometimes get overwhelmed with all that I have to do (presents, family get-togethers, Christmas donations for children via NY Cares’ Winter Wishes) …December is just too short a month! But one has to stay healthy or all that busy-ness can turn to tiredness…and overdosing on caffeine can be a vicious cycle. This holiday month, I plan to stay healthy and sleep well so I won’t need to cover up the under eye shadows and ruin every family Christmas picture I make it into. Exercise is important and helps you sleep better at night. So when I’m in the city, I try to ride my bike or walk wherever I go – building exercise into my schedule is easiest for me because I know I’m horrible at going to the gym. Although it’s harder to do when I’m in the Texas suburbs or when I’m traveling, I try to give up driving to the grocery store or sitting in the hotel room, by walking to the grocery store or walking laps around the hotel. (A UCSF study found that for every extra mile walked per week, there was a 13% less chance of cognitive decline for older women- it’s never too early to start building good habits! Cheesy but true.) My sister loves her pedometer. If I know I can’t sleep, I use Essence of Vali sleep products – plant-based aromatherapy that is really affordable and easy – just dab a little on your pillowcase at night and you’ll find drifting into lala land easy enough (watch out for samples with JUARA soon – Valerie, the aromatherapist founder, has graciously shared some of her soothing concoctions with us). And this will sound self-serving, but I swear that our Turmeric Antioxidant Radiance Mask really works. If I know I have a tough day the next morning, I sleep with this mask on – a thin layer goes on invisible, and while I sleep, the patented turmeric ingredient removes all the age-creating molecules I built up during the day. Turmeric is the miracle root of Asia – super detoxifying for the liver and the skin – it’s been shown in research as having extremely strong anti-cancer activity. But don’t get me started – I love Turmeric.